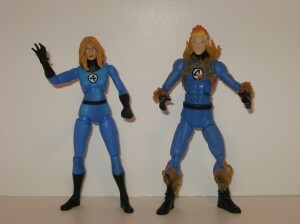 I was finally able to track down my last Marvel Legends Two Pack from the Wave Two revision (or Wave 2.5), the Invisible Woman and Human Torch. I have to admit this is my least favorite from this wave for several different reasons. 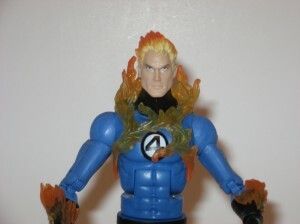 Let’s start with the Human Torch/Johnny Storm. How many times must we endure this re-used body? (*sigh*) This is, I believe, the fourth time so far. I could have lived with this body again, if they would have at least put some effort into a different head-sculpt this time around. This Anime/Manga look just needs to go away. This figure would have been so much better without the flaming up-swept hair. I can deal with the translucent flames surrounding his body, but the head could have been improved on this time around. The blue used on his costume seems to be just a tad darker than Reed and Sue’s as well. 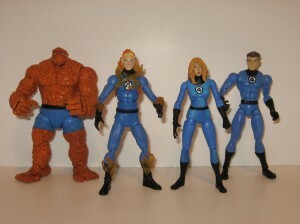 The Invisible Woman/Sue Storm Richards is using the same body that was used in the Fantastic Four – Ronin Series. The only difference is the detail in the two belts has changed. I’m pretty sure this is the same body that is being used for the Maria Hill/Sharon Carter Two Packs with some minor changes and details added. I am having a hard time seeing Sue with this head-sculpt. I do like it much better than the Ronin Series version. The hair is fuller and covers her face a little more. The plastic used on her head is a little darker, not so Emma Frost ghostly looking. The plastic used for the hair is pretty stiff too. Not so stiff that you cannot turn her head, but pretty firm. I think what really turns me off about this figure is they gave her a lighter almost white over-spray on her torso, which makes her arms and legs stand out as being darker. They could have skipped that detail and maybe have given us a clear/invisible shield for her to hold instead. This Two Pack contains no accessories, no extra heads, no weapons, nothing. I think that is another reason why this one is a very near fail for me. The only plus factor is to finally have the team in the most similarly costumed representations so far. 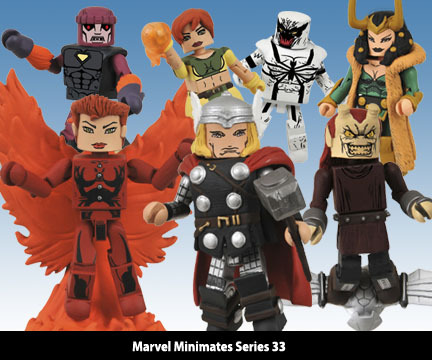 Not counting the movie versions this is the fourth time this team has been completed in Marvel Legends. I say leave this foursome alone for awhile now and move on to teams that we do not have. Thank you Hasbro, I know you are listening. I also picked up a second Dum Dum Dugan and White Hand Ninja Two Pack so that I would have two of the white versions of the Hand or Chaste Ninjas, whichever you prefer to call them. I am going to display this SHIELD body with the Unmasked Ultimate Captain America head from the first wave. I would like to continue building my SHIELD army, but I would rather have more of the Hand Ninjas from the first part of this wave. I think I am out of luck as far as finding more of those now, so unless I do, I guess I am done with these for now. You can read my thoughts on the rest of this wave here. 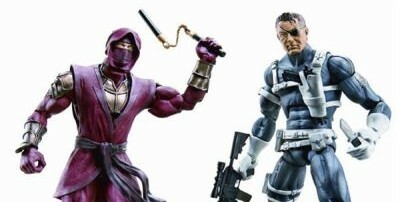 Overall, a pretty nice wave of Marvel Legends and I am very much looking forward to the Fan’s Choice selections coming soon.